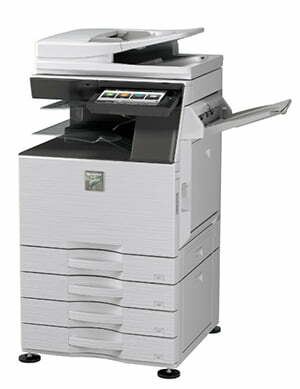 Sharp photocopiers and multifunctional printing devices, including light production printers. As a Sharp Centre of Excellence since 2010 we are experienced in supporting and servicing all Sharp printing equipment. Our staff have been trained directly by Sharp to maintain their devices and in order to offer technical support to our customers that have Sharp photocopiers. Sharp photocopiers offer a broad spectrum of functionality, which can be enhanced even further with a number of finishing options and machine configurations. A benefit of the Sharp devices is that you can choose exactly which finishing options you need to create your optimal working environment. Offices with high print volumes such as law firms, may require additional paper trays or punch units for hole-punching, whereas marketing departments or schools may require the ability to print booklets in-house. Every working environment is different and will have unique requirements. The Sharp range of photocopiers has something for everyone and can be configured to your exact needs. Sharp excel at fitting high speeds into small, ergonomic machines, making Sharp photocopiers easy to fit into the smallest of office spaces. From desktop printers that copy 20ppm up to large 70 page per minute devices, there is something within the Sharp range of photocopiers to suit any business’ needs. These photocopiers also utilise tablet technology in its touchscreen panel to display the machines operator interface, making it simple and easy for anyone to operate the whole range of Sharp photocopiers. A Sharp is an extremely cost effective device for customers consideration as they include a high level of specification under a well-known and respected brand. They are mid-range on the price spectrum for photocopiers. As a Sharp Centre of Excellence, Midshire is able to provide genuine Sharp toner cartridges for the full range of Sharp photocopiers. Everyone on a Midshire Managed Print Service will receive Sharp toner cartridges for the duration of their contract. Original Sharp toner cartridges offer superior print quality, and are designed to ensure the machine produces crisp and clear copies for the duration of its life. With a Midshire Managed Print Service, you don’t have to worry about running out of toner, our OneStop print management software monitors your toner levels and dispatches a new toner cartridge when you’re getting close to running out of toner. Our Managed Print Service not only proactively orders toner for customers, it includes on-site preventative maintenance, the booking of engineers to carry out any repairs and proactively collects meter readings, so customers don’t have to. So, you can rest assured that your Sharp photocopier will be looked after from the day you purchase it through to the end of the contract.